Visiting Christiaan Van Der Klaauw: To The Moon And Back! We turn into the parking lot of a modern, yet modest building in one of the northern provinces of the Netherlands, far away from the Swiss Alps where most haute horlogerie watches come to life. We are here to visit a pioneer in the world of astronomical watches: Christiaan van der Klaauw. It seems like an unlikely place for a watch manufacture, especially one at such an esteemed level. However, there are quite a few similarities with the horological Swiss countryside: surrounded mainly by farmland, cows dot the horizon and the air has a crisp, fresh scent to it. Only the mountains are absent; in fact, the manufacture is even located slightly below sea level, but that is not something that even remotely influences the steady hand of the watchmakers working at Christiaan van der Klaauw. Before Christiaan van der Klaauw was a brand, there was the man: Christiaan van der Klaauw was born in 1944 in Leiden, the city where he also completed his formal education. Initially, his focus was on the production of Friesian grandfather clocks in a style typical of the northern Netherlands. He steadily began incorporating ever more astronomical complications into these clocks. By 1980 he already created a clock featuring a carillon, declination of the sun, and a three-dimensional moon phase. Due to their novelty and increasing complexity, he rapidly began making a name for himself, and not only within the Netherlands. In 1989 he became a member of the A.H.C.I., the Academie Horlogère des Créateurs Independants, and in 1992 he even won an award for most innovative movement design in Basel for his Pendule Variable, a table clock that combined a rotating sun and moon with an astrolabe. At the height of his success, van der Klaauw realized that the end was near. Although his creations were second to none, clocks in general were considered old-fashioned by then, and the market for them was shrinking. Mechanical wristwatches, on the other hand, had just entered their renaissance, and so van der Klaauw took a photo of his award-winning astronomical table clock and put it in the copy machine, shrinking the image further with each copy he made. When it was small enough, he cut it out and put it on his wrist. While most people it would have stopped there, van der Klaauw simply went to work. And after several prototypes, he presented in 1996 his very first wristwatch, the Satellite du Monde. While quite an achievement by itself, for Van der Klaauw this was only the beginning. In 1999 he presented the world’s smallest mechanical planetarium, and in 2005 he translated his three-dimensional moon phase into wristwatch size. By that time van der Klaauw was coming close to retirement age, yet none of his children shared his passion. But Daniël and Maria Reintjes did share his vision and had already been friends with him for more than a decade as they had worked with him to produce watches for their own label, Dark Rush. To them, he entrusted his legacy. This changed the company a lot as suddenly Christiaan van der Klaauw went from being a one-man show to becoming a brand. Also, the Reintjes are designers, not clock- or watchmakers, although of course with a great affinity for watches. The designs became cleaner and far more focused on highlighting the astronomical complications – an important factor as the brand ceased production of all non-complicated models. This may seem like a surprising step as non-complicated watches are less expensive to produce, less expensive for consumers to buy, and therefore provide a steadier source of revenue. 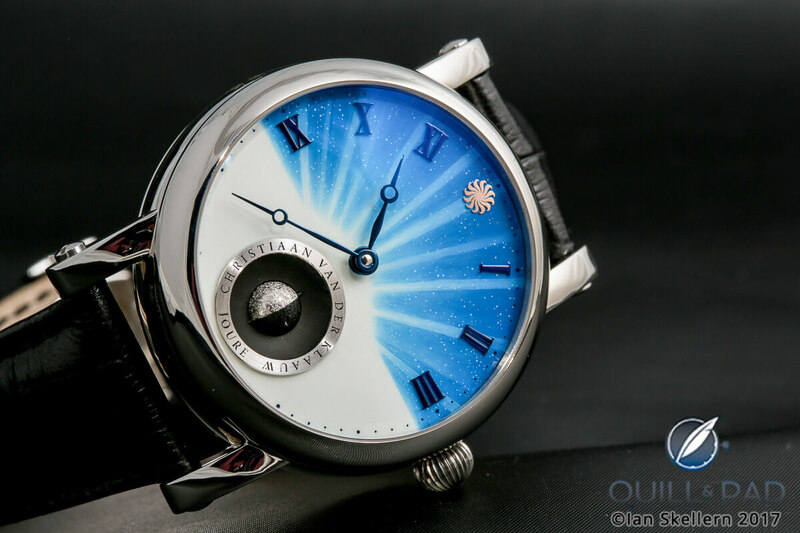 However, the Reintjes wanted to focus on astronomical complications as to them this represents the pure “DNA” of Christiaan van der Klaauw as well as what makes their watches different from all others. This is also clear inside the manufacture: the hallway is adorned with van der Klaauw’s early celestial clocks, while the display cases in the showroom are filled with the latest wristwatches, linking the past with the present. As a result of focusing only on watches with astronomical complications, the production actually is now lower than when Christiaan still owned the company. In fact, only a few hundred pieces leave the manufacture each year, and given the still-substantial size of the collection, only a handful is made of most models. Where owners and CEOs are normally quite focused on growth and conquering new markets, the Reintjes are surprisingly content with current production levels, perhaps because this leaves room for other projects such as the planetarium watches that they have created for Van Cleef & Arpels (see Astronomical Design: Talking To Daniel Reintjes, CEO Of Christiaan Van Der Klaauw). The first one was introduced in 2014, followed in 2018 by a new ladies’ model introduced at SIHH. It is quite unique that a small brand like Christiaan van der Klaauw works with a brand that is part of the large Richemont group. This testifies to the unique expertise that the independent Dutch marque has gathered. While certain parts of the watch are sourced from select partners, the complications are all dreamed up and made in-house. Advanced CNC machines share a space with the far more primitive hand-driven tools the independent watchmaker used to make his first watches. Development is a very important part of Christiaan van der Klaauw as it allows the independent to occupy a unique position in the world of haute horlogerie. An entire area is therefore dedicated to this purpose: it is here that the designs of Daniël and Maria are translated into mechanical masterpieces. Our tour halts on the top floor of the manufacture. In a closed-off workshop, protected from dust, three watchmakers assemble the Christiaan van der Klaauw watches. What is perhaps most interesting is that all the watches that they are working on are already sold and eagerly awaited by their new owners. In fact, when you order a Christiaan van der Klaauw, you have to wait on average one to six months before it is ready. In times when many Swiss and German brands have more production than actual customers, this is rare. However, it does help explain the contentment of the Reintjes. And Christaan van der Klaauw, the man? He is still around and comes to the manufacture at least once a week to have a cup of coffee. And when he does, one of the new models is always on his wrist because he is proud that his legacy is moving forward into the future. Disclosure: in researching this article, Martin Green (author) and Boris Pjanic (photographer) covered their own expenses. They received no inducements from either Christiaan van der Klaauw or Daniël and Maria Reintjes. Hi Martin, excellent writeup. It is so smooth to read and captures more than the essence of our visit. Great article, and one of my favorite independant brands. However one thing remains unclear to me after reading this article: from what I understood before, I thought that the first Van Cleef was developed with CVDK, whereas the modifications leading to the Lady Planetarium were entirely made by Van Cleef (which is no simple feat because of the addition of the moon). But your article suggests that the modification wasalso a collbaroation with CVDK. Do you know more about this? CvdK was also responsible for the Lady Planetarium! Exactly Elizabeth, during our visit we were told that the Lady Planetarium was in fact a development by CVDK. We were shown that they are able to make all the parts of the Planetarium. Thank you! Either I didn’t read correctly, or Van Cleef is slightly departing from its earnest habit of giving credit where it is due. I hope it is the first solution. I like the MB&F/Van Cleef style better than the in-house mystification. Van Cleef neither puts this information in its written press materials, nor broadcasts it loudly. But if you ask you get the correct answer, and that is already a thumbs up in my book (and much different from most brands, who don’t answer nearly as straightforwardly). MB&F does this quite differently: all suppliers (“Friends”) are stated in writing in the press materials. To my knowledge. MB&F is the only brand to do it this way. It is an excellent example, and one I wish the rest of the industry would follow! I hope they do the same when the lady planetarium appears on their website. I wholeheartedly agree that more brands should follow MB&F’s example… why hide when you worked with great people?